Predigital Camera Days~Had to dig out the scanner for these geocaching photos. Me, Ricky, Shaina and Christopher had a really good time on this day. This was the first of two caches we found today. Found it easy enough after we got our bearings. My son found it...the weather and wind must have blown the camoflage off cuz it was in plain view. We tried to cover it again so passers-by didn't get a peek. My son traded a small pocket knife for the nascar knife and my daughter traded a hot wheels car for a bubble pen. Won-der-ful. Beautiful colours that compliment the photos. I love the cute details - the cones in the upper left corner, the little animal in the corner of one of the papers as well as the guide post. Great job. 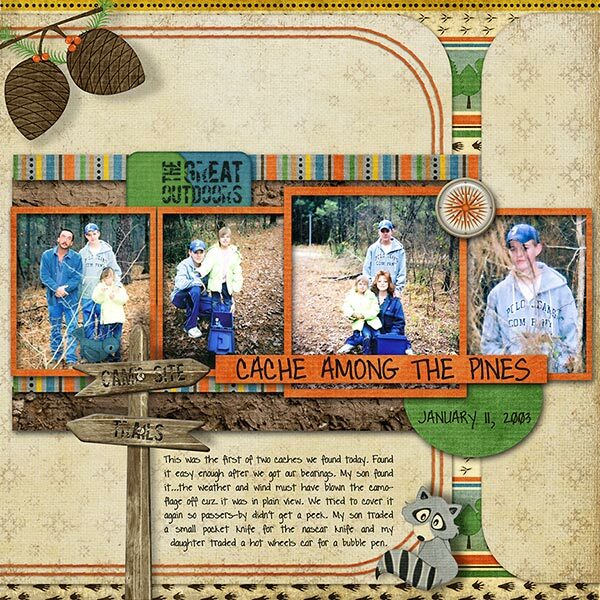 Great rustic page - love those photos! love all the colors you used!!! oh what a cool layout - I am trying to convince my dh to take my girls out to do this....need to show him your page. Great LO! That kit looks awesome with your photos! What a great page! I love the colors and the photos! Great job! Great kit with the pics! And I love the design flow. Beautiful page! I love that template! You picked the perfect kit for those photos! Awesome page! The kit compliments the photos perfectly!